I know, I know... it sounds like a cop show. 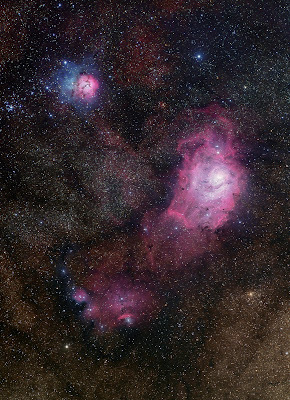 But this is actually the Trifid and Lagoon nebulae in Sagittarius, one of the summer highlights in the Milky Way. At a dark site, you can actually see these two naked eye (as little white smudges). But with longer exposure their colors burst forth! 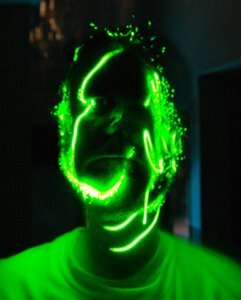 This was my second outing with the new STL camera. Okay, I am officially impressed. Now I know why this camera has been a staple in astrophotography for a number of years. It is a tank and creates fabulous data. I am still experimenting with my processing workflow, but seem to have hit a sweet spot by calibrating/aligning in Maxim, then data rejecting/combining in CCD Stack (and of course putting it all together in Photoshop CS3). Gama Cygni -- First Light! Well, I went and done it -- I went ahead and bought a "true" astro camera to compliment my FSQ scope. After learning the ropes with my little QHY8 one-shot color camera (a really nice little camera by the way) I decided to step-up to the "big league" with the STL-11000M camera from Santa Barbara Imaging Group. The STL is mono large chip (11 megapixel) that images through a built-in filter wheel to record color data in a series of passes. Why mono? Well, the mono chips are much more sensitive, and separate color passes provide much greater fidelity (think composite video vs. component video). Also this camera has much deeper wells than the QHY8, which translates into increased dynamic range, for resolving all those faint details. It also has programmable cooling and other features. Processing the LRGB images (separate Luminance, Red, Green, Blue) is much more daunting than simple one-shot color. There is at least 4 times as much data, and additional calibration frames are a must. But the end results speak for themselves. Although this image is a quick test, I am already excited about the differences I am seeing in the data (and you know you're a nerd when "data" excites you). 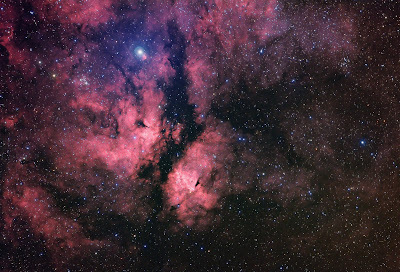 This image is from the Gamma Cygni region in the Cygnus constellation. It is a large complex of Hydrogen Emission nebulosity. Hence, I shot my luminance data through the HA filter of my new camera (another boon to this type of camera -- just program the filter wheel to whatever filter you want, then bang away). Anyway, this is my "first light" image -- the first time this camera has seen starlight. This is also my first attempt at using a new program to process my data (CCD Stack), and of course the first time I have tackled a LRGB image. But I must say, I am very happy with my progress thus far (and yes, it is also a bit nerdy to say "thus"). 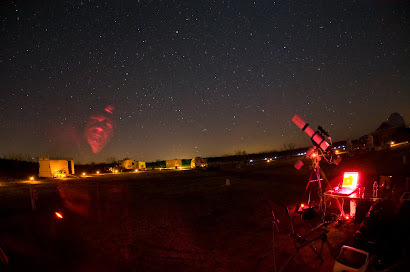 The Texas Astronomical Society had a "work party" at their dark site in Atoka, OK about a week ago to do some maintenance. I went up to lend a hand (and eat some damn fine pork ribs). It was hot during the day, but cooled off nice at night. There were high clouds, but once the moon set (around midnight) the clouds disappeared and the skies were awesome. 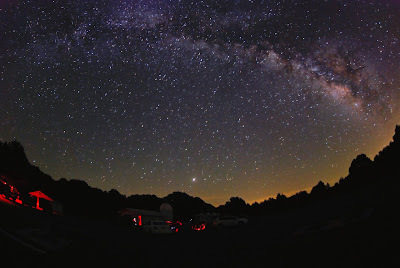 It is always worth the trip to a dark site to see the Milky Way rise. That bright "star" on the horizon is Jupiter. I got some great views of the ol' gas giant through a club member's TEC 160 refractor -- nice! This image is a simple 60 sec exposure taken with my Nikon D80 on a fixed tripod. 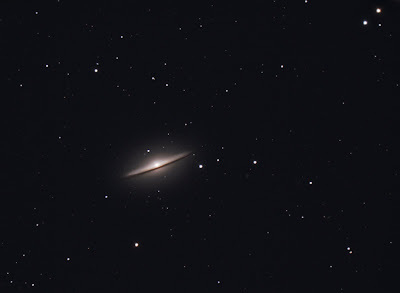 Here is the famous Sombrero Galaxy (also known as M104). This galaxy was discovered in 1781 and has been a favorite for generations. It is a great example of a "lens-shaped" galaxy and has a dense accretion disc that is beautifully silhouetted by over 400 billion stars. I captured the light of these 400 billion suns at the recent TSP.